Did Palin Pressure Daughter to Give Birth? 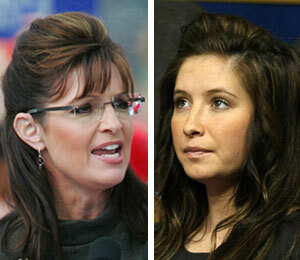 Did Sarah Palin pressure daughter Bristol into keeping her out-of-wedlock child? That's false! In an interview with FOX News, Bristol Palin put an end to the speculation. She said her mom's anti-abortion views did not play a role in her keeping the baby. The 18-year-old told Greta Van Susteren, "It was my choice to have the baby -- that kind of stuff just bothered me." The Governor is proud of her daughter's decision, saying, "She is an amazing mom and this little baby is very lucky to have her." Bristol gave birth to son Tripp in December.